At Lifeline, we are thankful for a lot of things. Our state-of-the-art ambulances, our outstanding partners and clients, and most certainly our employees, with whom we would be nowhere without. To show our thanks, we started something new this Thanksgiving. We distributed turkeys to all our employees in Illinois and Detroit. Each and every one of our employees was able to sign up for a turkey and receive it from us in our garages the Monday and Tuesday before Thanksgiving. 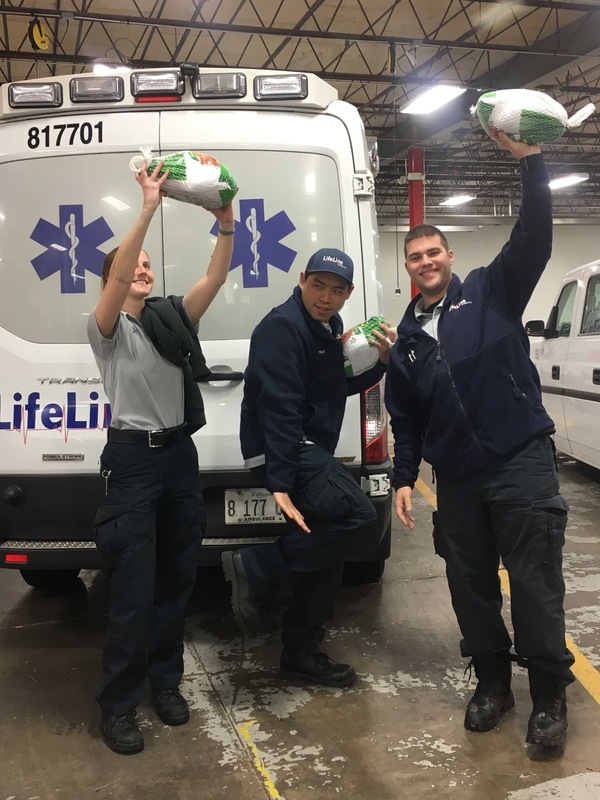 We gave out over 230 turkeys, and our employees could not have been happier. It gave us tremendous joy to be able to enhance the holiday for every member of our Lifeline family. Thanksgiving is all about giving thanks; it’s in the name! And what better way to do so than by giving back to our extraordinary crews and employees? Every Thanksgiving table needs a delicious turkey, and we were happy to be able to provide that to so many families this year. After all, Lifeline is a family, and families give back to each other. This was our way of saying happy holidays from us to you, and thank you for all that you do as a member of our family.